Hi ya lovelies! I am so excited to share my first Guest DT card with you today. I fell in love with these stamps and knew I had to create a fun little ocean scene. Stamp images in Black Memento Ink onto Gina K Pure Luxury layering cardstock. I colored my images with Copics. I used dies for the banner and sentiment. I used 2 different sized hole punches for the bubbles. I found paper in my stash that resembled bubbles. Simple, fast and fun! 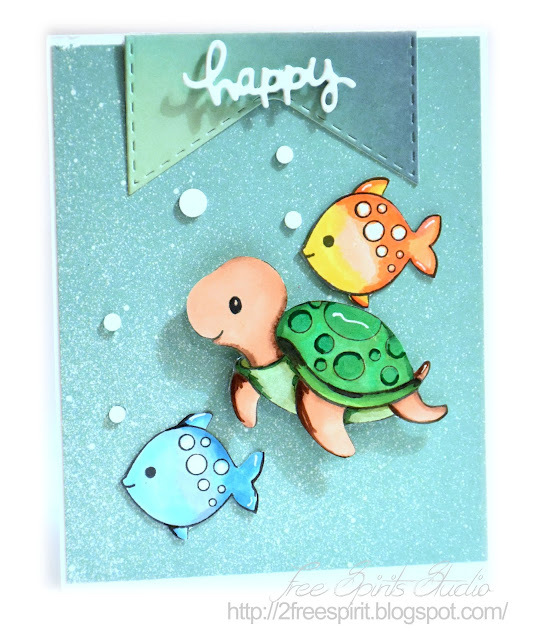 There are so many options with these cute stamps, anyone could create a fun and simple aquatic scene. I take time to craft and read every single day. I can't imagine not being creative and feeding my soul. I create card, scrapbook and digital design. I love digital photography, am crazy about paper, addicted to organization of all kinds and I can honestly say I am nuts about planners. Oh yeah, I can't forget that I am obsessed with Hedgehogs and Gnomes! Whilst crafting I listen to books on CD so I can enjoy a good story AND crafting at the same time! Awwwww, that is the best story EVER and thank you so much for sharing it with us! We have a turtle as well and his name is Vinny. He used to live in an aquarium in my craft room and would get up and dance to Shakira every time she came on! LOL He has gotten quite big so during the spring, summer and fall he lives outside in a habitat my husband built for him. LOL So glad to have found another turtle lover out there! !